I sort of embellished for dramatic effect in my last post when I concluded with the statement that: Only more data will tell us the answer to the million dollar question: Is it Standard Model or New Physics? In the case of the \(B_s\) mixing phase, \(\phi_s\) this isn’t strictly true. More data will improve the measurement of this quantity using the \(B_s \rightarrow J/\psi + \phi\) decay. 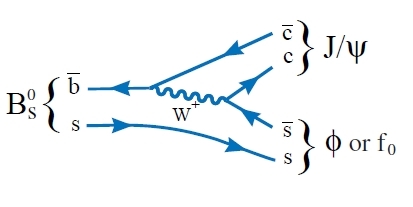 However, we can measure \(\phi_s\) using other decay modes of the \(B_s\) meson. One such decay is \(B_s \rightarrow J/\psi + f_0\). As you can see from the Feynmann diagram, this \(J/\psi + f_0\) decay is very similar to the \(J/\psi + \phi\) decay. However, it occurs at a much lower rate. So low in fact, that LHCb was the first experiment to observe it! The first error value quoted for the experimental results is from statistics, while the second error value from systematic uncertainties. Looking closely at the numbers, you can see that both experimental results are consistent with each other and with the Standard Model, and both experimental results have larger statistical errors compared to systematic errors. Comparing the two experimental results now, the \(J/\psi + \phi\) result has a smaller statistical error compared to the \(J/\psi + f_0\) result due to the lower rate of \(J/\psi + f_0\) decays. The \(J/\psi + \phi\) analysis used \(8276 \pm 94\) signal events, while the \(J/\psi + f_0\) analysis only found \(1428 \pm 47\). On the other hand, the \(J/\psi + f_0\) analysis is simpler than the \(J/\psi + \phi\) one, resulting in the smaller systematic error.